Biocartis said today it will partner with Bristol-Myers Squibb (BMS) to develop a companion diagnostic for the pharma giant’s immuno-oncology therapies based on the Belgian molecular diagnostics developer’s Idylla MSI test. Under the collaboration—whose value and other financial details were not disclosed—Biocartis and BMS agreed to pursue joint development and registration of the Idylla MSI test for use in a variety of indications, commercial settings and geographies. The first focus under the agreement, according to Biocartis, is expected to be the registration in the U.S of Idylla MSI as a companion diagnostic test in metastatic colorectal cancer (mCRC). Idylla MSI is designed to assess a patient’s microsatellite instability, the result of inactivation of the body’s DNA mismatch repair (MMR) system. A status of MSI-High is found in tumors that include urothelial, prostate, pancreas, adreno-cortical, small bowel, sarcoma, mesothelioma, melanoma, gastric, and germ cell tumors—as well as approximately 15% of CRC tumors, according to the patient advocacy group Fight Colorectal Cancer. MSI is believed to be an independent factor that may predict a patient’s response to certain immunotherapies. In July 2018, the combination of BMS’ two cancer immunotherapies—Opdivo (nivolumab) and Yervoy (ipilimumab)—was approved by the FDA as the first immuno-oncology combination treatment for adult and pediatric patients 12 years and older with MSI-High or mismatch repair deficient (dMMR) mCRC that has progressed following treatment with a fluoropyrimidine, oxaliplatin and irinotecan. 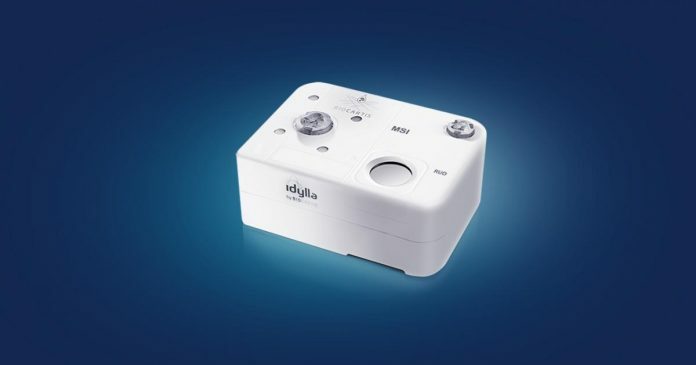 Idylla MSI, which received CE-IVD marking in Europe on February 28, is designed to provide information on the MSI status of CRC tumors within approximately 150 minutes from just one slice of FFPE tumor tissue, without the need of a reference sample.